Are you planning a last-minute trip to the beach or mountains before the end of the summer and the beginning of the new school year? Are you planning on taking your dogs or cats with you or leaving them at home under the care of a family member, neighbor or pet sitter? If you don't have anyone to come to your home to feed and care for your pets, have you investigated local boarding facilities? There are a lot of things to think about when considering whether or not your pets will join in the family fun during the summer vacation season. Traveling is highly stressful for both you and your pets. 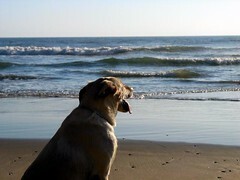 Planning and preparation are essential to a successful vacation with pets. Does your dog or cat like to travel in the car? Many pets, particularly cats, would prefer to stay home where they are in a familiar environment. If your pet gets sick when traveling in a car, it's probably best to leave them at home. Some pets do not do well traveling because of illness, age, injury, or temperament. If this is the case, discuss the various options with your veterinarian. Your ultimate decision of whether to include your pet in your travel plans will vary depending on the mode of travel and your final destination. If you will be staying with family or friends during the trip, find out in advance if the pet is welcome in their home. If you are staying in hotels, motels, parks, and campgrounds, make sure pets are allowed or kennel facilities are available. If pets are allowed in your hotel/motel and you have to leave your pet alone in the room, put the "Do Not Disturb" sign on the door and let housekeeping and management know that there is a pet alone in the room. Use a portable kennel if you have to leave your pet alone in a hotel room or in the homes of friends or relatives who are not comfortable having your pet loose when no one is home. Any time you travel with your pet, make sure your pet is properly identified with a current tag and/or a microchip. In addition to the standard identification tag, your pet's collar should include a special travel tag with information on where you are staying while away from home. 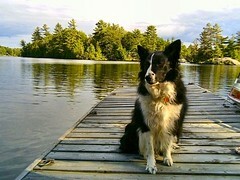 Carry a current photo of your pet with you to help with identification in case your pet becomes lost. Having your pet's favorite foods, toys and dishes with you will make your pet feel "at home" and more comfortable. Make sure you have proof of rabies vaccination and a current health certificate if you will be crossing state or international borders. Pet parents should think carefully about flying their pets on commercial airlines especially if they plan on checking them as baggage. Unless your pet is small enough to fit in a carrier that will fit under your seat and the airline allows you to bring pets in the cabin, you may not want to fly with your pet. The various airlines have different rules and regulations on pet travel including restrictions on breeds and size, whether they allow pets in the main cabin, the number of pets allowed on each flight and whether they charge for checked kennels. Most airlines require a health certificate issued within 10 days of the departure date. You should check with your airline well in advance for their current regulations. Most major airlines have this information on their websites. Choose the most direct flight to your destination. This will help reduce the stress on you and your pet. Reconfirm your flights the day before travel to ensure there have been no unexpected flight changes that may impact your pet. Get to the airport early, exercise your pet, personally place it in its crate, and pick up the animal promptly upon arrival at your final destination if you have to check your pet as baggage. When boarding the plane, let the flight attendant know that your pet is in the baggage compartment. Before leaving on your trip, make sure your pet is familiar with the carrier in which it will be traveling. Whether your pet travels in the cabin with you or in the baggage compartment, he/she should be completely comfortable with the kennel or carrier that he/she will be traveling in. 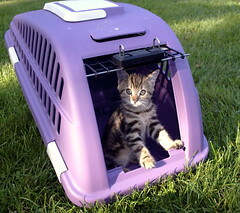 Trying to escape from a kennel is one of the most common causes of injury to pets traveling by air. Ask your veterinarian for advice on feeding your pet prior to air travel. Air travel on an almost empty stomach is usually recommended. The age and size of your pet, the time and length of your flight, and your pet's regular dietary routine will be considered when feeding recommendations are made. Tranquilizers are generally not recommended because of the increased risk of heart or respiratory problems. If your pet is not accustomed to traveling by car and only rides in the car when going to the veterinarian, take it on short rides before your trip so it will feel confident that a car trip does not always mean a trip to the veterinarian. Cats should always be confined to a cage or in a cat carrier while in a car to make sure they feel secure and protected and to prevent them from ending up under your feet or in your lap while you are driving. The cat's carrier should be secured by a seatbelt. If your dog will be riding in a truck bed, he/she should be confined in a protective kennel that is properly secured. If riding in a car, dogs should not ride in the passenger seat if it is equipped with an airbag and should never be allowed to sit on the driver's lap. Harnesses, tethers, and other accessories to secure pets during car travel are highly recommended and are available at most pet stores. Pets should not be allowed to ride with their heads outside car windows due to the danger that pieces of dirt or other debris can get in their eyes, ears, and nose, causing injury or infection. Keep your pets on their regular feeding schedule and give them their main meal at the end of the day or when you reach your final destination. Feeding dry food is the most convenient, assuming that is part of their normal feeding routine. If you use canned food, throw away any unused or uneaten food unless it can be refrigerated. Keep a plastic jug of cold water in the vehicle just in case other reliable water sources are not available. Give your pet small amounts of food and water and plan to stop every two hours for exercise and potty breaks. Make sure you have a leash with you. And always remember that pets should never be left unattended in cars even for short periods of time. If your pet will be traveling with you, make sure you have a pet first-aid kit that includes bandages, antiseptic/antibacterial cream, gauze squares, tweezers, cotton swabs, hydrogen peroxide, a pet first aid book and, of course, any prescription or over-the-counter medications your pet normally takes. You should also have the phone numbers of your veterinarian and a national poison control hotline. If you have pet insurance, contact the company and find out how to handle emergencies when away from home. Ask your veterinarian if he/she can give you the name of a veterinarian at your vacation destination or contact the local visitor's bureau or chamber of commerce for information on local veterinarians and emergency veterinary clinics. You should pay special attention to your pet's behavior while traveling, especially their eating, drinking and potty habits. Be on the lookout for any unusual discharges from the nose and eyes, excessive scratching or biting of any body part, abnormal elimination, or excessive water consumption. Contact your veterinarian if you are concerned about any physical or behavioral changes. Read a story about a couple who took an RV vacation to Best Friends Animal Sanctuary with their dog.